Shown like all widows without jewellery and here additionally with the symbol of a juniper tree in the background. The juniper tree never points towards the name of the depicted, but has always been used as a symbol of mourning, death and rebirth since ancient times. By the way, at least until 1926 this portrait had the title "Portrait of a young Woman" (in: Paul Schubring: Die Kunst der Hochrenaissance in Italien, Berlin 1926 (second Edition). Only after that an art historian gave this young lady the name "Ginevra de Benci", because the juniper tree reminded him of the female name "Ginevra". In 1926 the art historians still gave this painting the title "Portrait of a young girl", therefore the identity of the depicted young woman had got lost in the past. A bust of Fioretta Gorini, the widow of the assassinated Giuliano de' Medici, made by Andrea del Verrocchio. Who did Fioretta Gorini immortalize first: Leonardo da Vinci in the painting of her or his master, Andrea del Verrocchio, in the bust of her or were the representations of her made at the same time, around 1479/1480? Many clandestine marriages in the 15th and 16th century caused big problems for the children of this kind of relationship because they were very often regarded as illegitimate children, since only very few people knew of the marriages of their parents. The only child of Fioretta Gorini und Giuliano de' Medici, their son Giulio de' Medici, had the same problem. He did not go down in history as Giulio Gorini, the illegitimate son of Fioretta Gorini, but he bore the name of his father "de' Medici". In 1513 some monks and the brother of Fioretta Gorini confirmed the clandestine marriage of the latter with Giuliano de' Medici. Their marriage was recorded in the Regest Leonis X. (n. 4598) for all times. (in: J. Nardi, Le storie della città di Firenze, Firenze 1684, p. 274). "When, in the autumn , there was a question of his [Giulio de' Medici] being made a Cardinal, it was attested by witnesses that a valid marriage had taken place secretly between his father and mother, Floreta, a special deed to that effect being drawn up [Regest. Leonis X., n. 4598]; and, on the 23rd of September, 1513, he was, at the age of thirty-five, raised to the much-coveted purple. Giulio received as his title S. Maria in Domnica, which had been that of Leo X. before he was elected Pope." (in: Ludwig Pastor, The History of the Popes – From the close of the Middle Ages – Drawn from the secret archives of the Vatican and other original sources, Volume VII, London 1908, pp. 81-82). 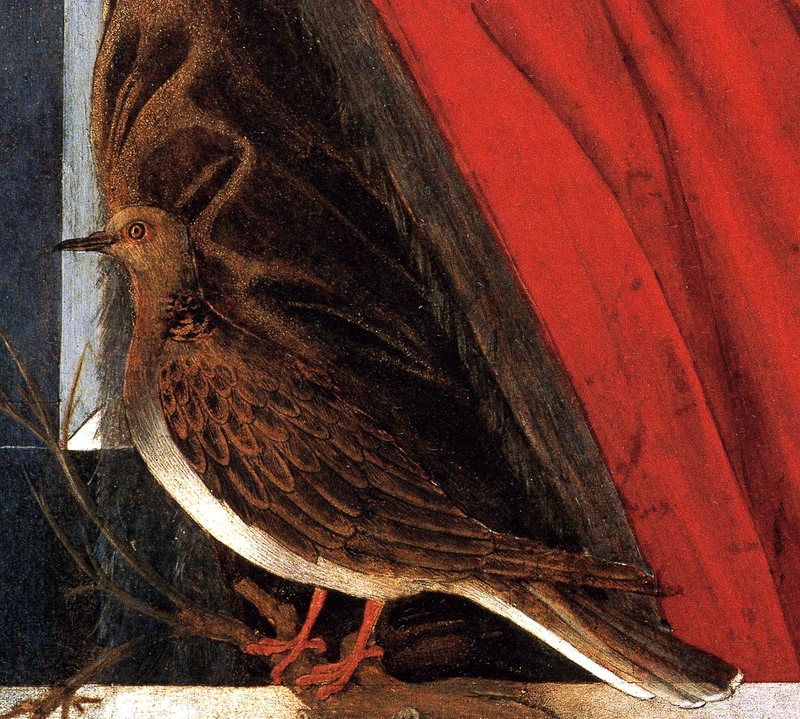 During the Renaissance, the turtle-dove was used by married couples (not lovers!) as a symbol for eternal love and for continual faithfulness. According to Aristotle, this animal was monogamous and would never take a new partner after the death of the former one. With the help of this painting here, which was commissioned with certainty by Fioretta Gorini herself, she tells us that for her there will be no more joy in life (the withered, leafless branch) and that for her like for the turtle-dove she had only one partner, her husband Giuliano de' Medici, and there would never be another one.